Inside the Apple: Lincoln and Seward ASSASSINATED!! We've always found it interesting the definition of the word "assassinated" has changed so much over time. Today marks a somber anniversary -- it has been 150 years since John Wilkes Booth burst into the box at Ford's Theater in Washington, DC, and shot President Abraham Lincoln, who died the next morning. 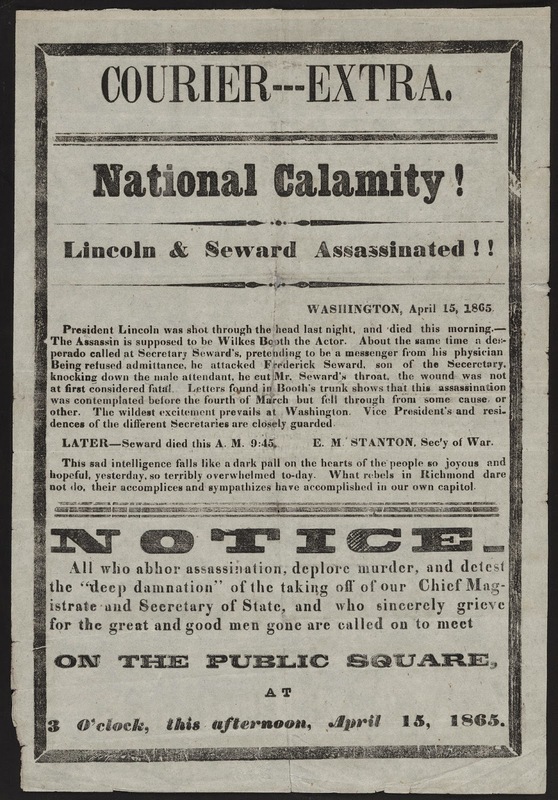 As you can see above, newspapers were reporting that both Lincoln and Secretary of State William Seward had been assassinated. This wasn't a rush to report the news that later needed to be corrected; in 1865, "assassinate" meant to attempt to kill someone for political purposes. You could be assassinated and live, as was the case with Seward. In all the commemorations of Abraham Lincoln's life and death, it's easy to forget that he was not the only target that night: Booth and his co-conspirators were planning to also kill Vice President Andrew Johnson and Secretary of State William Seward. Even though Lee had already surrendered to Grant, Booth reasoned that if they could kill the President, the Vice President, and the Secretary of State all on one night, the Union would be thrown into disarray. And, with no formal right of succession--which wouldn't be codified in the Constitution until after the Kennedy assassination--Booth might have had a point. Seward died in 1872 and is memorialized in New York City in a famous park on the Lower East Side as well as in a grand statue in Madison Square Park (above). 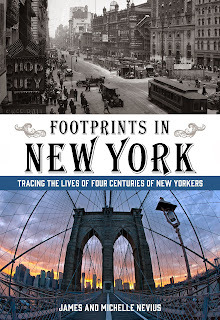 We talk much about Booth and Lincoln in Footprints in New York: Tracing the Lives of Four Centuries of New Yorkers, but if you'd like to explore Civil War-era New York, join James on Saturday, April 25, when he'll be leading a walking tour honoring Lincoln's life and commemorating his death. Read details about the tour at http://blog.insidetheapple.net/2015/04/walking-tour-saturday-april-25.html.